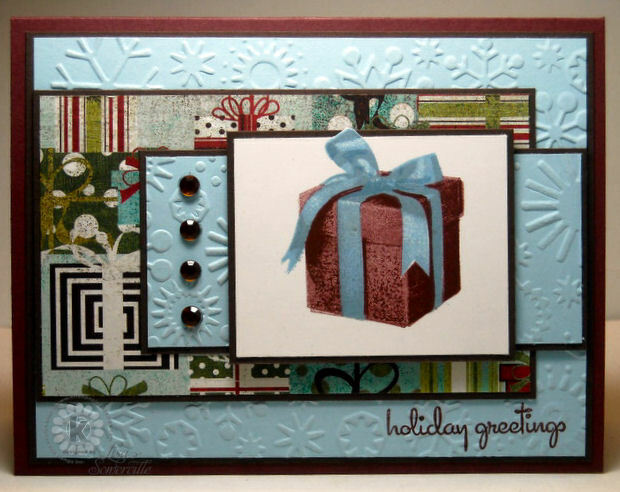 Designs by Lisa Somerville: Merry Christmas Eve! Happy Kitchen Sink Stamps Monday, and a Merry Christmas Eve! Just a quick card share for you today using Kitchen Sink Stamps Multi Step Gift stamp set. I also wanted to let you know that Kitchen Sink Stamps 35% off After Christmas Sale starts tomorrow December 25th and will run through Friday, December 28th midnight PST. Just click here to shop the Kitchen Sink Stamps Store, and 35% will automatically be deducted from all in stock items in your cart upon checkout. If you missed clicking on the link, just enter code HOHOLISA upon checkout, when you shop the Kitchen Sink Stamps Store. Have a wonderful week, and a very Merry Christmas! Beautiful card, Lisa! That lovely gift box sure does pop! Wishing you and your family a very Merry Christmas! Hugs! Merry Christmas, Lisa!! Great card. Very nice, Lisa! Love the embossing, too! Sweet Christmas card! Love the blues and browns and the layout!